ood  another passion of ours! There's really no better way to enjoy the complexities of Pinot Noir than around the table with friends, family and a savory meal. 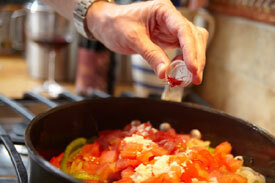 In a large, deep skillet or saute pan, heat olive oil over medium-high heat. Add onion and serrano and bell peppers. Reduce heat and cook for 20 minutes over medium-low heat, stirring occasionally. Add tomatoes, two cloves garlic, paprika, thyme, saffron, salt and pepper. Cover and simmer for 15 minutes. Meanwhile in a separate small skillet, add one clove minced garlic to a dash of olive over medium heat. Lightly brown chorizo, remove to a plate, and then lightly saute halibut, shrimp and clams. Remove to same plate. Stir rice, chorizo, seafood and 1/2 cup of chicken broth into simmering vegetable mixture. Bring to a boil, then reduce heat to low. 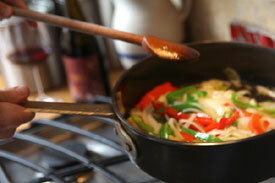 Cover and simmer over low heat for 20 to 25 minutes or until rice is tender. Check at 15 minutes for liquid absorption, if dry add a bit more broth. Test for seasonings at same time and add more if needed for flavor. Serve in cooking pan with parsley for garnish. Fresh crusty bread and a green garden salad with a light dressing of olive oil, high-quality balsamic, salt and pepper make great accompaniments. Heat oil in heavy large pot over high heat. Sprinkle spareribs with salt and pepper. Working in batches, add ribs to pot and brown all sides, about 6 minutes. Transfer ribs to bowl. Add onion, garlic, cherry peppers and crushed red pepper to pot. Sauté until onions just begin to brown, about 10 minutes. Add tomatoes with their juices. Using back of fork or potato masher, coarsely crush tomatoes. Return spareribs and juices to pot. Add broth, wine, thyme and bay leaves and bring to boil. Reduce heat to medium-low. Simmer uncovered until spareribs are very tender and sauce thickens, stirring occasionally, about 2 hours. Season with salt and pepper. Drain and return pasta to same pot. Add cheese, parsely and some sauce from spareribs and toss to coat. Transfer pasta to large bowl. Top with spareribs and remaining sauce and serve. Put all the above ingredients except for the lamb in a food processor or blender (if using a blender make sure you really get the ingrediants finely blended). Spread mixture on the top of the lamb -- fat side, not too thick. If it looks like it's not done, it really is. Please don't overcook! Combine olive oil, pineapple juice, lemon juice and garlic in a gallon-sized plastic bag. Add salmon, and marinade at least 2 hours in the refrigerator. Preheat grill to medium, using indirect heat. Meanwhile, thoroughly mix remaining ingredients in a small bowl. Remove salmon from marinade and rub the spice mixture on all sides of the fillet. Discard marinade. Rub grill with olive oil. Grill fish for about 4-6 minutes per side, or until just cooked through. Serve with thinly sliced lemons for garnish. Rinse chicken inside and out with cool water and pat dry completely with paper towels. Drizzle olive oil inside and outside, spreading over chicken so it is completely covered. Rup kosher salt and fresh groud pepper inside and outside of chicken. Cut lemon and orange into quarters and stuff inside chicken Stuff all other ingredients inside chicken and distribute evenly. Place chicken in a small roasting pan, roast for approx. 1 1/2 hours. 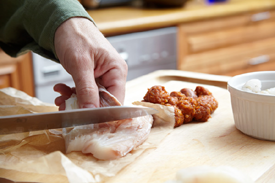 Check with thermometer to make sure it is at least 180º and juices are clear when pierced. Serve with mashed red new potatoes or mashed sweet potatoes. For red potatoes, boil 1 to 1 1/2 pounds small red potatoes in salted water for 25 minutes. Mash with a fork, then add warm milk or buttermilk, butter, kosher salt and fresh ground pepper, sometimes throwing in some sour cream. For sweet potatoes, slice into chunks, boil, and when you mash, add sprinkling of cinnamon and large pinch of brown sugar. Press pastry dough evenly into bottom and up sides of 9-inch (23 cm) pie plate or fluted flan pan with removable bottom. Chill for 15 minutes. 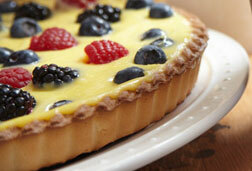 In medium bowl combine berries with lemon rind, sugar and flour. Spread evenly in pastry shell. In small bowl, beat eggs with milk and vanilla; pour over berries. Bake in 425F (220C) oven for 15 minutes, reduce temperature to 375F (190C) and bake for 40 minutes longer or until puffed, and knife inserted in centre comes out clean. Let cool.